SALINAS, CA – In the fertile growing regions of the central coast of California, scientists are looking for ways to increase organic production of strawberry and other crops. Because cover crops can provide weed and erosion control, determining the best method for establishing a uniform and dense cover crop stand as soon as possible after planting is a critical first step. The authors of a new study say that determining optimal planting strategies that accelerate cover crop emergence and reduce light penetration to weeds should be a primary focus. Eric Brennan and Jim Leap from the U.S. Department of Agriculture, Agricultural Research Service (ARS), coauthored the study published in the April 2014 issue of HortScience. Brennan and Leap evaluated the effectiveness of three secondary tillage implements for soil incorporation of broadcast cover crop seed compared with drilled seed using legume-rye cover crop mixtures. “Our study was motivated by the need for effective strategies that will enable small-scale growers who do not have access to drills to grow uniform and weed-suppressive cover crops on beds,” the authors said. Both drilling and broadcasting methods are commonly used to plant cover crops. In vegetable and strawberry systems in the central coast region of California, grain drills are commonly used by medium- to large-scale farms, whereas smaller-scale organic farms with fewer resources often broadcast cover crop seed onto the soil surface and incorporate it into the soil in a separate pass with a secondary tillage implement. Brennan and Leap explained that few studies have compared the two methods for their efficacy with planting cover crops. “The effects of these contrasting sowing techniques on crop performance vary depending on a variety of factors, making it difficult to conclude that one method is universally preferable,” they said. The researchers compared four planting treatments (drill, broadcast plus rototiller, broadcast plus cultivator, and broadcast plus disc) and point implements (seeder, seeder plus rototiller, seeder plus cultivator, and seeder plus disc) for planting rye mixed with either purple or common vetch on beds. “The implements evaluated in the study represent those typically used in organic and conventional vegetable row cropping systems in California and were configured for a 2.03-m wide bed system, which is a standard bed configuration here,” the authors said. The experiments were conducted in Salinas, California, with winter- and spring-sown cover crops for establishing rye mixed with either purple or common vetch on bed tops at a seeding rate of 140 kg·ha-1. Results showed that drilling required less time than broadcasting because the broadcasting methods all used a second pass to incorporate the seed. According to the authors, drilled cover crops had greater uniformity and faster emergence, characteristics that would likely increase their ability to suppress weeds that emerge with the cover crop. “The main problems with the broadcasting methods were delayed emergence and lower cover crop stands that were likely the result of greater variability in seeding depth,” the authors said. 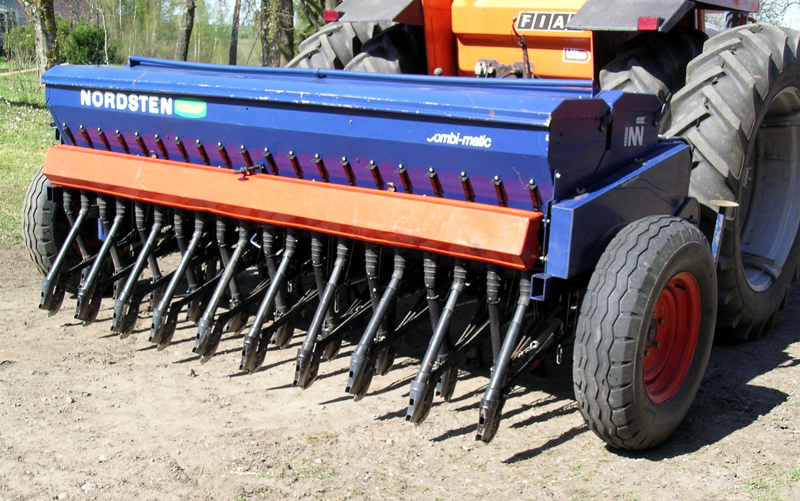 The data showed that the best methods for incorporating broadcast seed into the bed were a rototiller or a cultivator with tines and a rolling basket, preferably at 50% to 100% higher seeding rates than drilling. Read the full study via Comparison study of planting methods shows drilling favorable for organic farming.